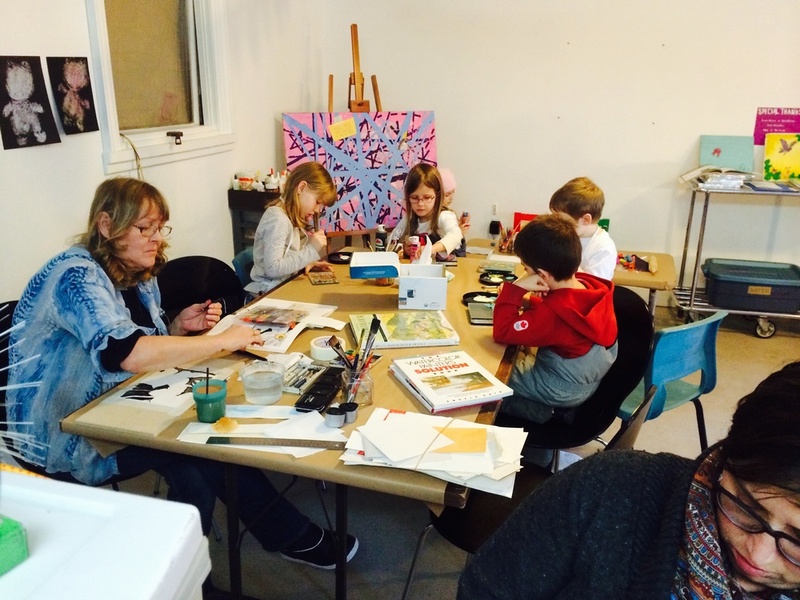 January 23, 2015 The studio was buzzing with 53 artists of all ages who joined us and typed on old typewriters, felted, tried watercolour painting, made quilts and inspired each other. This was our biggest day since our Open Studio launch so it was a genuine treat to be among so many creative people in our community. The first people through the doors on Friday: a combination of folks who had been before and two curious people who saw the sign at street level and were inspired to stay and learn how to needle felt. This is one of their pieces: a gorgeous wave. And a sweet owl. What was so lovely in particular was that our regular participants were offering encouragement and tips while we worked with the after school crowd. Jeighk joining the "plasticine scene" table where students from St. Catherine's School, SJAM and Shambala School joined us and played with texture, blending and building imaginative scenes. The watercolour and glass painting table! The glass came from Fowler, Bauld & Mitchell - an architecture firm in downtown Halifax that donated samples of glass and other materials before they moved to their new Hollis Street location. The samples have inspired us all! A game involving mystery objects obscured by handmade felt, much joy and laughter. The wedding dress cape in progress along with sewing projects and sculpture. Working on 16th note teaching tools and a gorgeous rain stick. Without a doubt the most popular thing going on in the studio in mid-January! So many variations on melted crayon art and explorations. A portrait drawn of this writer working on poetry and plays. A first time needle felter's gorgeous landscape with frame. 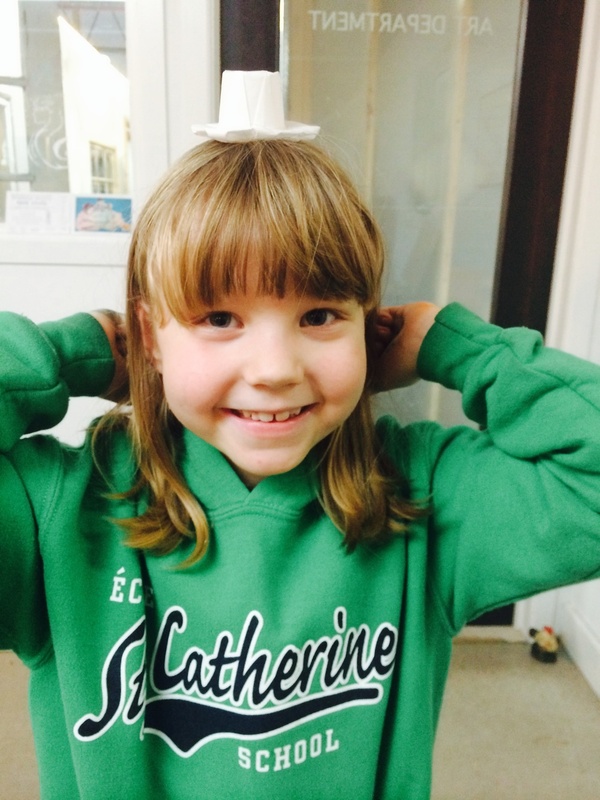 This artist designed and made, with her mom, an awesome headband - lace and elastic! Back for the second time to finish screen printing. Hugely popular type writer for letter, poetry explorations! Crayons, hair dryer. This was a popular exploration by Oxford students at several points in our afternoon! There were first time felters who stayed for the full five hours of Open Studio! And so much sharing of technique and information! Jeighk helping with screen printing. Teachers are taking these simple ideas back to their classrooms! The results! Simple paper hand cut stencils and beginning to explore multiples. Towering sculpture "dude" from found materials. Citadel High students working on props for their play! Felted brooch and fashion accessories for her doll! An expressive canvas! Who can resist glitter and paint? Moments before the glitter glue explosion! Making the headband featured above. The genius behind the moustache mirror. This artist was on fire with glass, paint, found materials. Oxford School's Schools Plus worker brought us some dedicated artists who worked til long after we closed down! "There might be some glitter in the Modge Podge now....!" January 9th - Wet snow and a quiet start but the room was alive with 35 new and familiar neighbours and visitors. So excited about folks who came in from Sambro area because they were curious! And new Oxford Junior High students who made so much and loved the freedom to explore materials. Friends from Team Possibles returning and leading the way for new felters; more amazing pin cushions; dancing to live music (played by request! 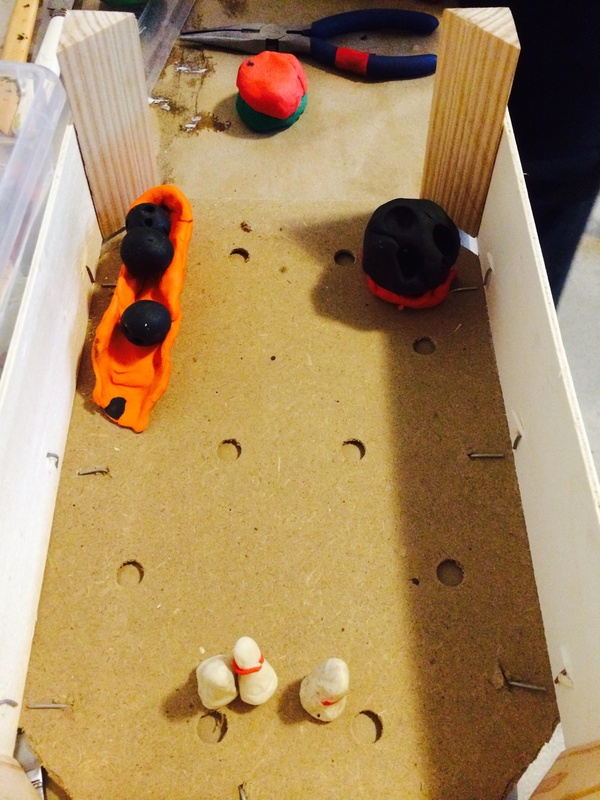 ); a bowling alley made from plasticine; and so many generous offers to bring in donations of materials. We thank you all! Quiet beginnings: needle felting, settling in and sharing tips about writing grant applications for open studios. Bowling alley!!! 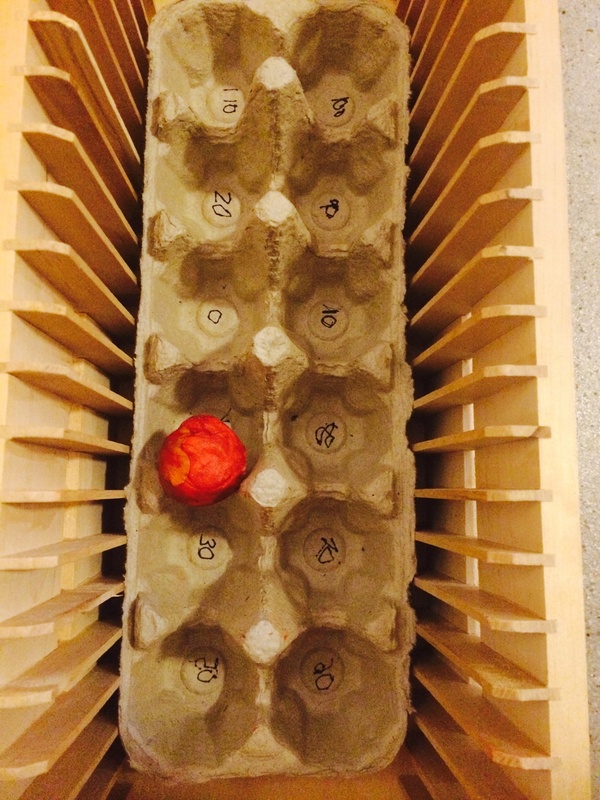 From an adapted orange crate and plasticine. 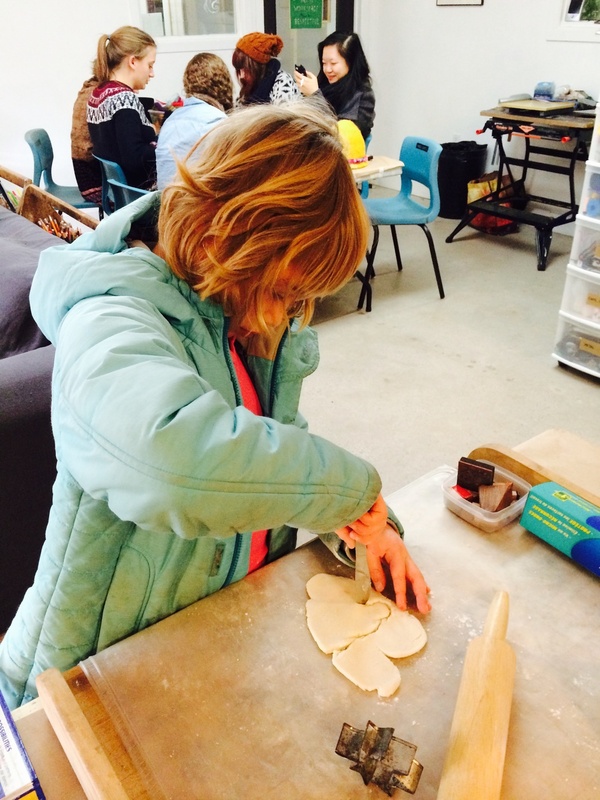 Felting, plasticine and snacking after school. Wet screen printed images transported safely by great collaborators. Painting on glass awesomeness. Glass donated from architect friends at Fowler Bauld & Mitchell - thanks! And only an hour after writing 'glass paints' on our wish list, we had a neighbour drop by and offer us materials - including glass paints! 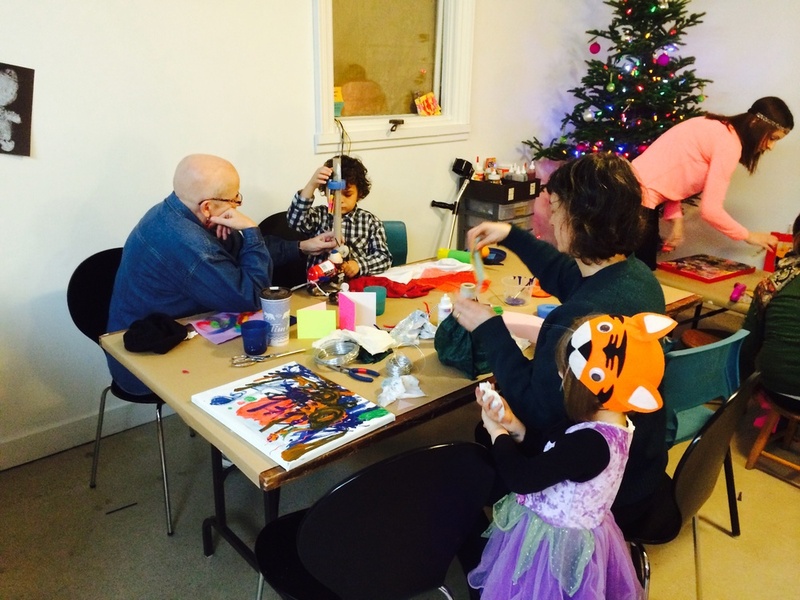 Here are some snapshots of our first open studio of the new year. Great turn-out and lovely to meet some new neighbours! Who knew a pillow made from Masking tape and drawer liner could be so comfortable and special! Parents of school playmates got to meet for the first time at Wonder'neath. So great to have a creative meeting place! 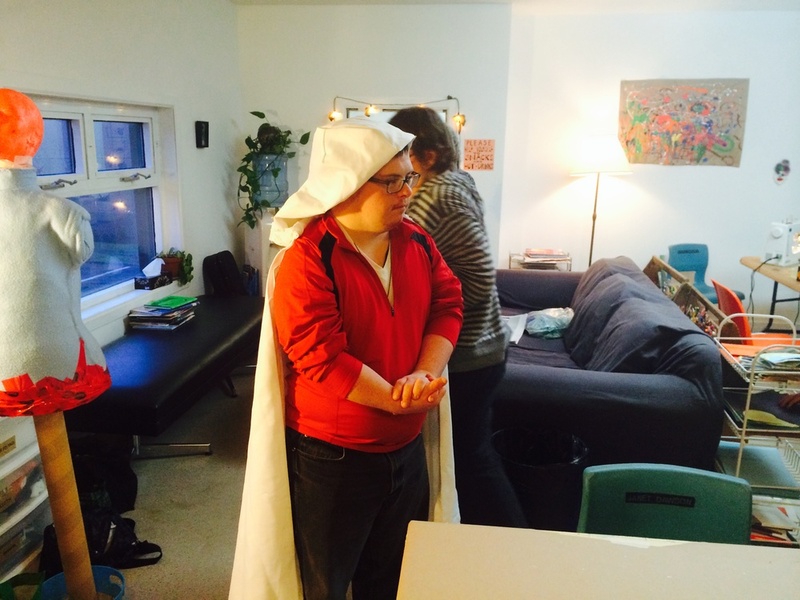 The epic "cape from a wedding dress" evolves through collaboration. 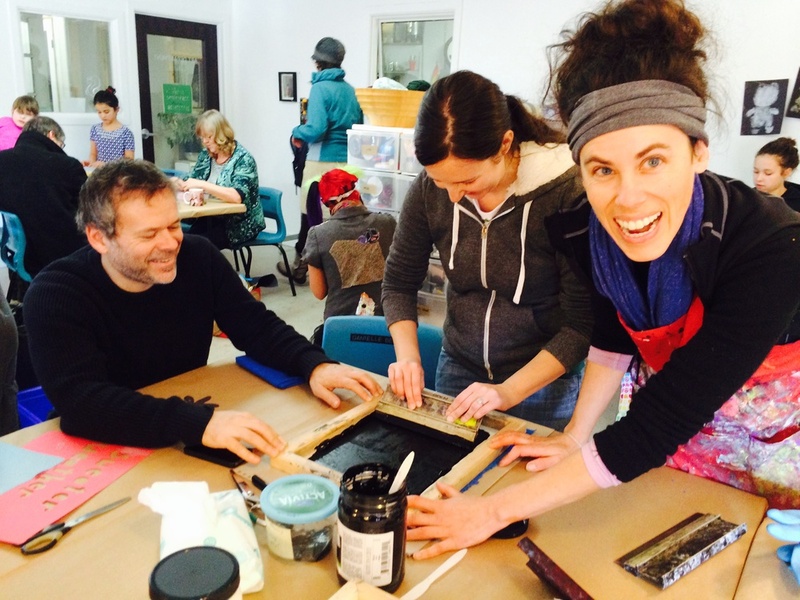 Stencils and fabric paints - all donated to the studio - were a hit. Some neighbours dropped in en route to another destination, and this artist (who visited once before during a school visit) knew she wanted to screen print! ... Which totally inspired many folks in the room! And inspired our focus for the next Open Studio: screen printing!! Love the interaction that goes on among participants. Two of our board members met during the drop-in session. Completely unplanned! We love that the studio has become a meeting place for new and old friends! A vintage pincushion - so lovely! The last project of the day - and a chance to get to know a nearby neighbour! Awesome drawing of this 3-D printed doll! Great place for a reunion!! Our open studio was the site of a surprise visit by Melissa's brother who works out west! Little drawing of Joseph Beuys and coyote getting a handmade frame. A collage for her work environment - to brighten things up! Mittens made by our facilitator, Heather, collected just in time to cross town for Handel's messiah. Our facilitator Jeighk absorbs the content of this mixed media work just before we closed our door for the night. Last art and conversation of the night. Notice the trophy on top of the shelves? Here's what it looked like in progress. Now ready for the final version? Dad of the Year award! So much conversation throughout these sessions. We already can't wait until next week! 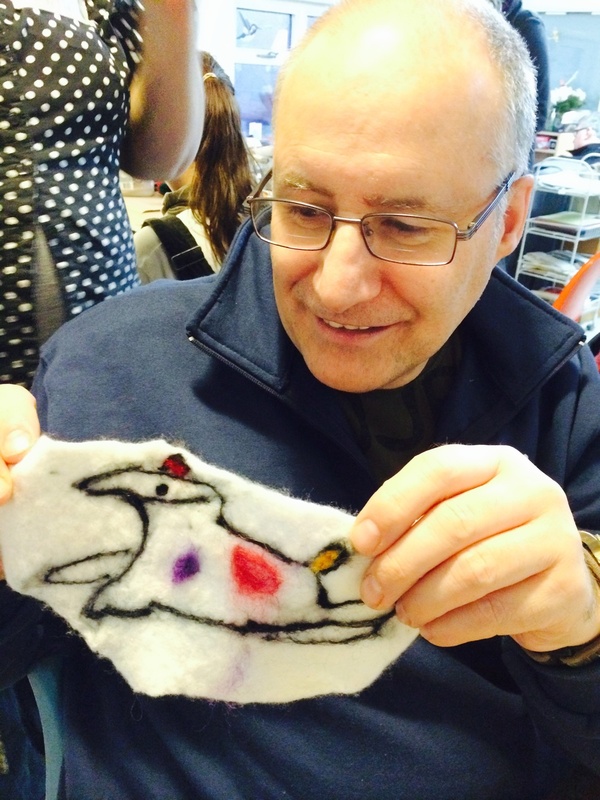 L'Arche neighbours joined us for needle felting. 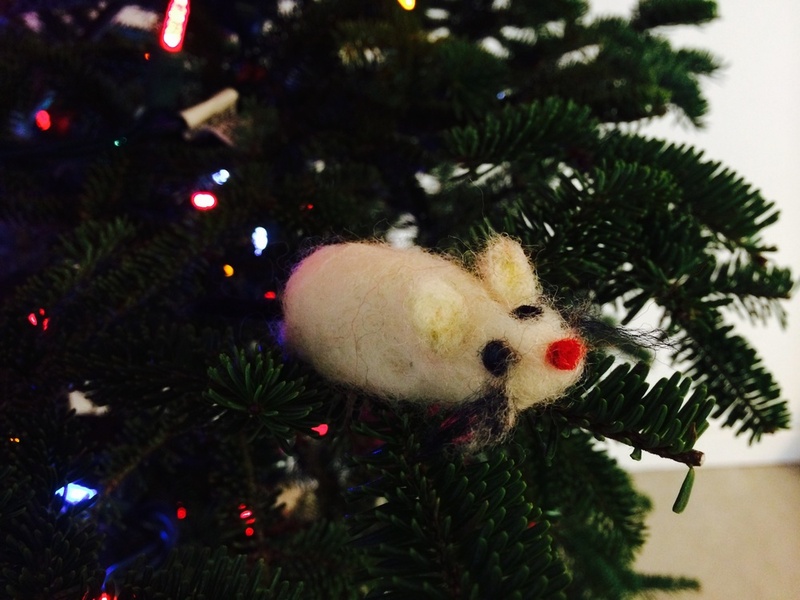 At the same table, an experienced felter who shared tips with us and made a little mouse to hide in the tree. Collage, mixed media in black and white. Sculpture with so much character built from found objects from the Open Studio bins. 38 people joined us for our Open Studio on this Saturday, many returning for the second or third time since we opened. Paint, flaming faux fur, paper. Kind of an amazing combination really! 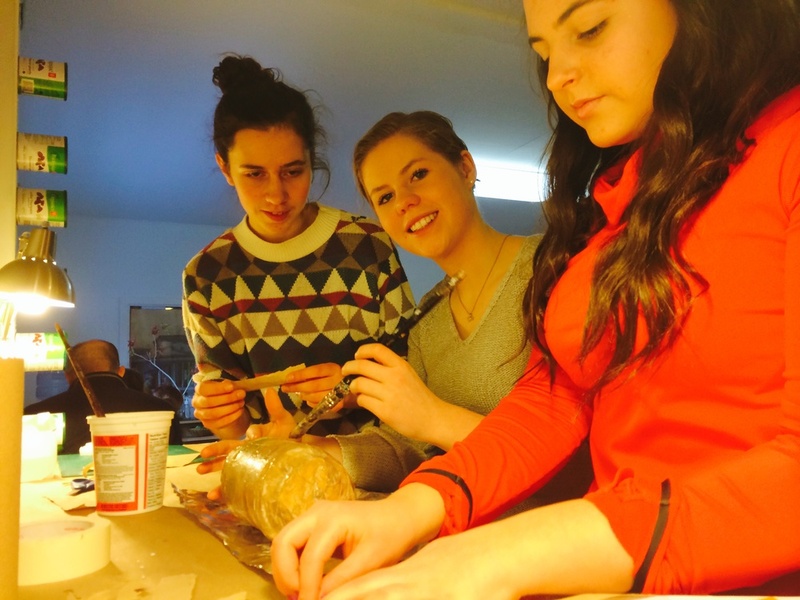 After a hectic fall semester, Halifax Grammer School senior students took a break at the studio! Felting, drawing, painting... the group expressed excitement at having time to be creative together, something their busy school schedule doesn't allow. Collage artists using found paper, old National Geographics, mixed media. Basic salt dough ornaments with a stamp twist. We tried stamp pads and rolled out block printing ink and both ways created lovely, bold results. Holiday letter writing, felting, adding patches to garments. This may have been the beginning of an exquisite corps drawing game that went around the table. Our favourite spot to hang out and chat, snack, meet new neighbours. 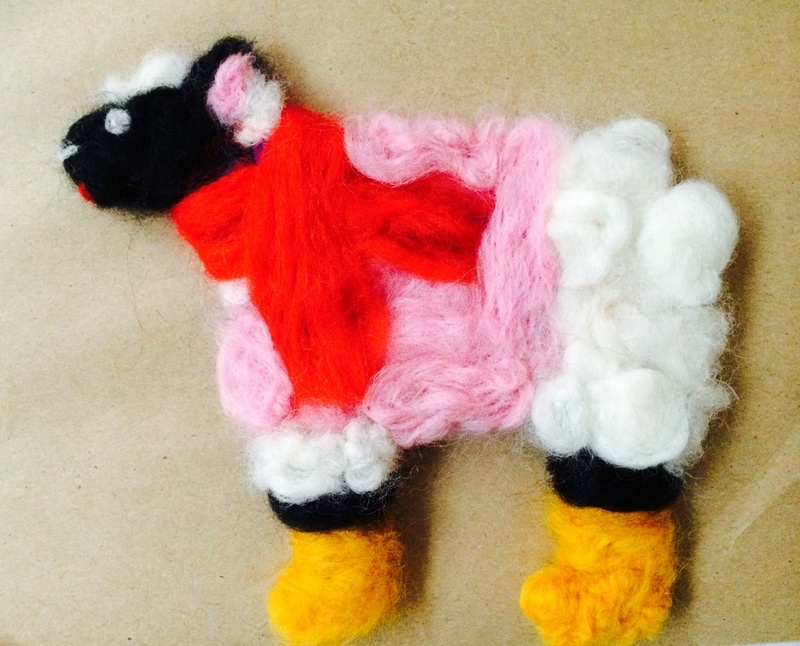 Another felted sheep - this one 3-D! Wonder'neath Open Studio - first Friday! Here are some images we wanted to share from our first Friday being open. We had many visitors who saw the sign at street level and came to join us after school. A great mix of return visitors and new creators of all ages. Big kids at the little table! Even an artist from New Brunswick! A hat for all occasions! 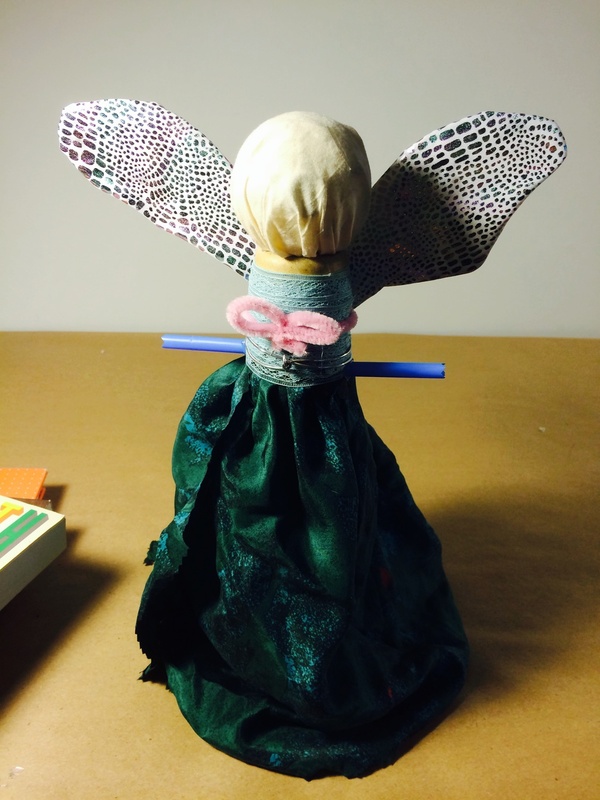 An angel making soup -- made from found and reclaimed materials. Heather working on gorgeous mittens from old sweaters. We love them already! There were so many sculptors on site today: plasticine was a HUGE hit! Magic birthday card from scrap paper and lettraset - intriguing many minds! Second week of working on the cape. End of session tea and mandolin playing. 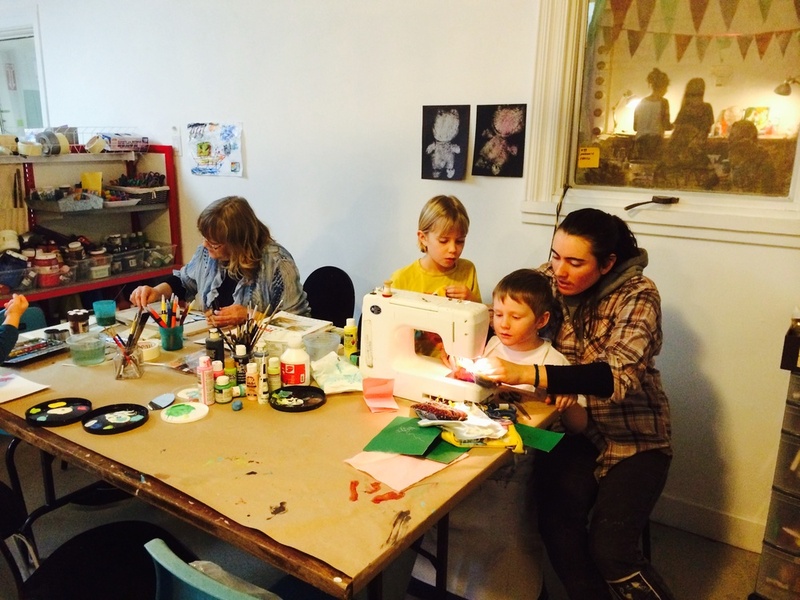 We were so pleased with the turn-out this week and how many neighbours came to the studio for the first time. A neighbour was curious when he saw our sign at street level, and after touring the studio, he shared his paper engineering skills with Oxford Junior High students, then they tested the aerodynamic plane in the studio hall! 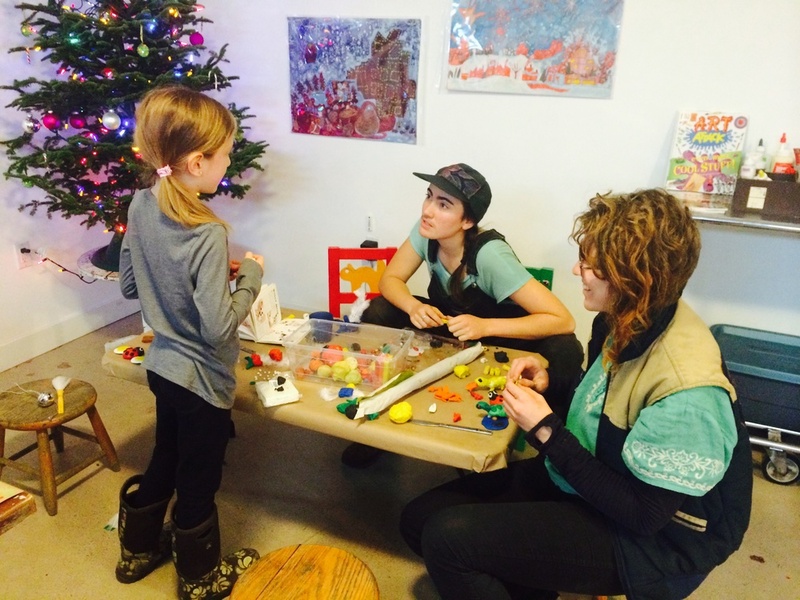 There was a table for smaller artists who loved the glitter, glue, and plasticine. 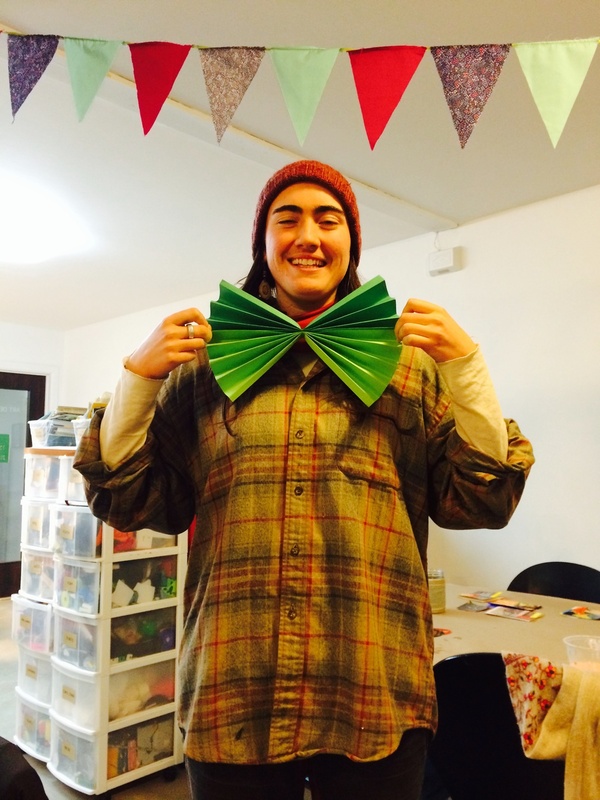 Our facilitator Jeighk got the sewing machine threaded for a first ever (!) sewing project. There's a fine handmade bag with a fantastic orange strap! 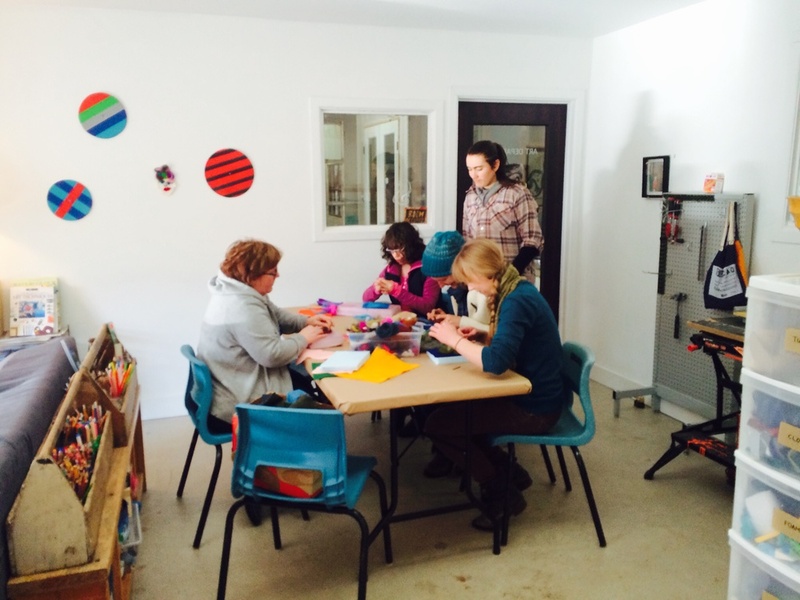 Below, our facilitator Heather and friends cut paper in preparation for card making. Our first participants were from Oxford School! Hand drills came in handy to support ambitious sculptures. A wedding dress got transformed into a cape, and sketching happened in the cosy corner next to warm tea, a bowl of oranges.